APMFG Fab. Inc. can build your bench to your request. No Back Perforated metal Bench. surface mount or inground , sand blasted and powder coated two stage. All benches carry 1 year warranty. New Stainless Steel Bus Stop No Back Perforated metal Bench. 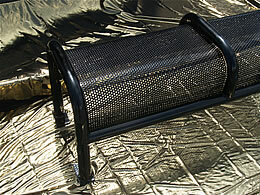 New Stainless Steel perforated no back bench will never Rust and it will never need painting. All Purpose Mfg. Inc. manufactures the Stainless Steel perforated metal bench out of Type 316L Stainless Steel. 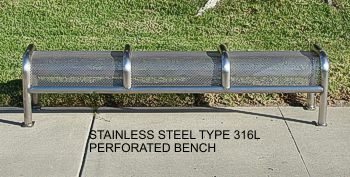 Perforated stainless steel bench will withstand Salt Air, high corrosive chemicals, if tagged with spray paint then clean with paint remover and it will never damage the bench. Transit Agencies will save money on maintenance personal. Steam cleaning not a problem, sand paper not a problem. Lengths available 2 foot, 4 foot, 5 foot, 6 foot, 8 foot 10 Foot. Type 316L Stainless Steel is used in General grade for food processing, chemical storage and transport, textile dying equipment, cladding of nuclear fuel, and oil refining equipment as well as some medical implants.